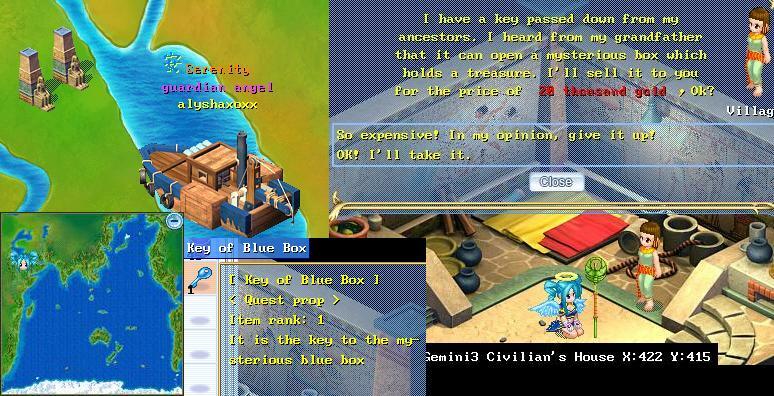 The seven coloured keys is for getting the Turtle Car OR Motorbike design as Otger’s guide shows; however, the locations for the 7 keys and treasure boxes was summarized briefly. BLUE: Location - First house in Cairo. Speak to the Villager. Requirement: Pay 20k. Receive BLUE key. BLUE: Location - Cairo Quest. Talk to the little boy. He is in the house behind the Temple Tower (across the bridge, behind the Props Shopkeeper). 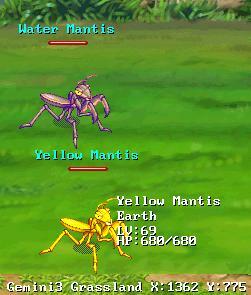 Requirement: Catch a Yellow Mantis, which can be found in the Grassland, which is to the right of Cairo. Make sure you have one free pet space. Return to the little boy and receive BLUE key. RED: Location - Cairo Quest. Talk to the Soldier outside the cave. He is in the second map of Cairo Grassland. 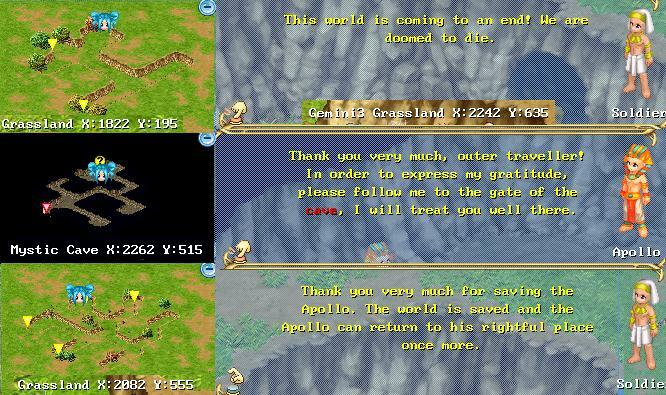 He will instruct you to go into the cave to help Apollo. Requirement: There are two battles in the cave. After the fight, return to the Soldier and you will receive a RED key and Cyan Devil Spar (+6). Keep Ayatollah sealed because he has mess. Kill top Mob first and spawn, then bottom Mob and spawn, then Ayatollah. *Note: I’m not sure what the lowest level a team can be to complete these battles would be, but I did this battle easily and none of my characters were RB. RED: Location - Holy Village on South Island. 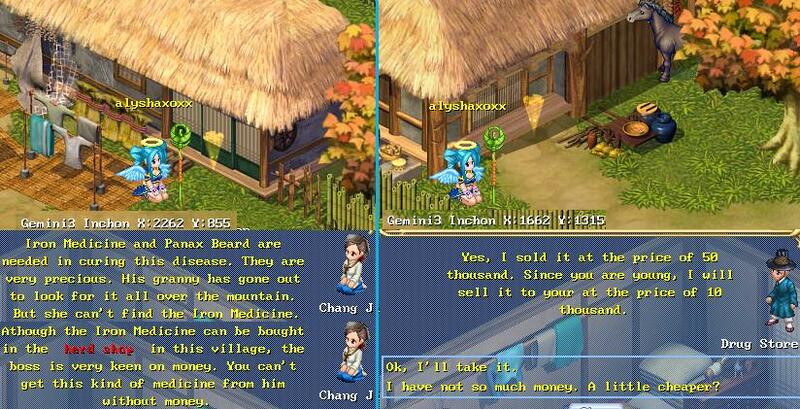 Talk to the Villager in the second map of Holy Village (across the bridge and behind the first house). Requirement: Pay 20k. Receive RED key. RED: Location - Kyota (Japan - called Koyota on Map) Quest. Talk to the Vendor to activate this quest. He is located behind the Inn. Next, walk to the cave. The cave is up two sets of stairs at the top of Koyota. Enter the cave and walk to the question mark on the second floor. Requirement: There is a battle in this cave. After the fight, return to the Vendor and receive a RED key and one Star. My suggestions for the battle (see above) remain the same for this quest. Keep Shading Puppet Lord sealed because he has Terra. I found this battle easier than the battle with Ayatollah. GREEN: Location - Inchon (Korea). Talk to the Vendor in the village of Inchon. He is sitting behind the Props Shopkeeper and Weapon Shopkeeper’s Tent. Requirement: Pay 20k. Receive GREEN key. GREEN: Location - Inchon (Korea) Quest “Dr. Chang’Jin”. Talk to Chang Jin in the village of Inchon. 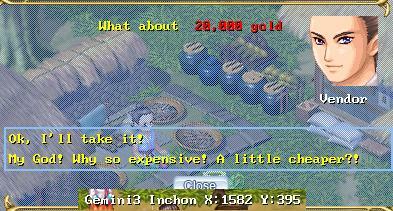 She is in the first house to the right of the Props Shopkeeper. Requirement: Go to the Drug Store Owner. Pay 10k and receive Iron Medicine. Return to Chang Jin and receive a GREEN key and 5% EXP Bolus. *Note: Need to have completed the Oh! Ginseng! Quest to activate this quest. Talk to the Granny. Click the leaves on the Ground. Receive Smile Mud Statue. Kudos alyshaxoxx, You have made a very informative guide, easy to understand and simple to follow. Great job!!!!! There are two types of idiocy: Believing everything one is told without question, and never listening to what one is told. The Hubris of Youth Versus The Folly of the Elderly. No one wins. Just a personal observation but we all need to remember to be civil to each other. We are all different and have different opinions. Just treat others as you would want to be treated yourself. Constructive criticism is one thing that we all need and can use, sarcasm, name calling, and abuse is not. @delecaty90/caseylollies It's only 70k in total, so not too bad. Maybe most people collect keys for the rewards in the boxes. thank goodness we have this forum. the wl.igg forum is pretty much useless when looking for guides now with its new form.